It's no secret that I love cycling & one of the reasons I do is that it's a great equalizer. It's affordable to just about anybody & cheaper than anything but walking. People of all ages & almost all abilities can do it (especially when you look at the incredible range of adaptive bikes out there). Riding a bike is a great way for kids to burn off energy & a good start to a lifetime of healthy, active living. Back to the topic of equality & accessibility: Main Street's local bike kitchen, Our Community Bikes, is selling children's bikes for $5. 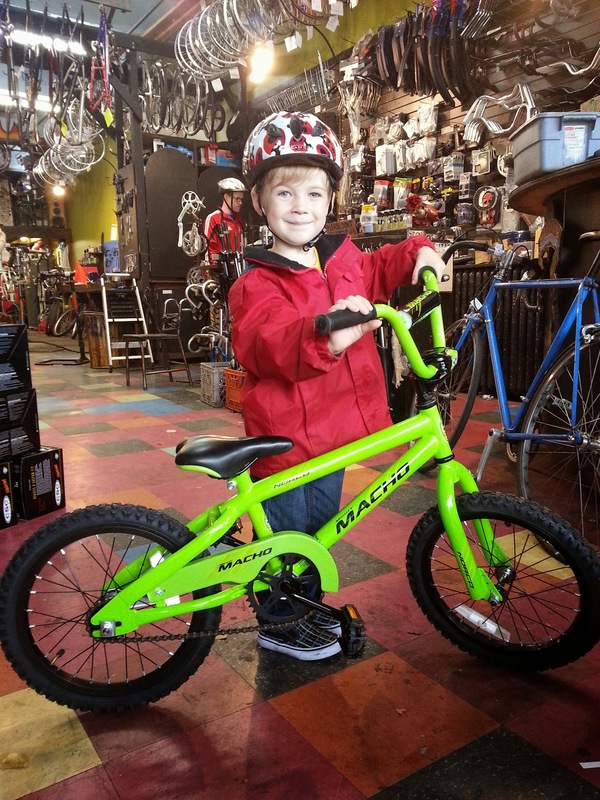 If your child needs a bike & your budget for one is low, OCB is a great place to look! Every bike is tuned up & fully functional. They're a wide variety of sizes & styles, donated to the shop. They might not be shiny & new, but for $5, you may have a little wiggle room in your budget for some spray paint or streamers & a basket. The kids' bikes at OCB are always $5, so head down there to take a look. If you don't see what you like, come back again in a week--they're always getting more. In case you're thinking of getting a bike for yourself, OCB has a selection of reconditioned bikes for adults at budget-friendly prices too. You could probably get your whole family riding for less than a month's worth of bus passes, in fact. Our Community Bikes (OCB) is a full service repair shop, bicycle recycling depot & an educational workspace for people who want to fix their own bikes or learn how. You can just drop your bike off if you don't have time, but they love to help people learn about bikes, from the basics, like fixing a flat tire, to more advanced stuff like bleeding hydraulic disc brakes. They have nearly all of the tools, new & used parts & accessories you might need to fix up your old beater or complete your dream bike. OCB also endeavors to be a safe space for all marginalized people which means that they have a zero tolerance policy on homophobia, racism, sexism, ableism, etc. As a collectively managed, non-hierarchical organization there is no owner, boss, supervisor or manager. All staff are mechanics, teachers & students who are learning & improving all the time as individuals & as an organization. Your first time at the shop, take a couple of minutes to read over their 'Ten Commandments'. OCB is located at 3283 Main Street, just north of 17th Avenue. Find out more on their affordable rates, courses they offer, & more on the OCB webpage.